Temporary Protected Status to end for over 200,000 Salvadorians in U.S.
Last Tuesday January 9th, 2018, the Trump administration delivered another blow to recipients of Temporary Protected Status (TPS), this time to over 200,000 Salvadorians living and working in the U.S. Since late last year the Department of Homeland Security, the government agency in charge of determining which countries merit TPS, had decided that the humanitarian program was no longer appropriate for Salvadorian, Haitian, and Nicaraguan nationals and that it would not renew TPS for these countries when the termination date arrived. An 18 month “grace” period would allow Congress to find a legislative solution, according to DHS Secretary Kirstjen Nielsen (JDSUPRA). The decision has left thousands of migrants with a precarious future and their countries of origin with the difficult task of reintegrating thousands of migrants who have been gone for roughly 20 years on average. 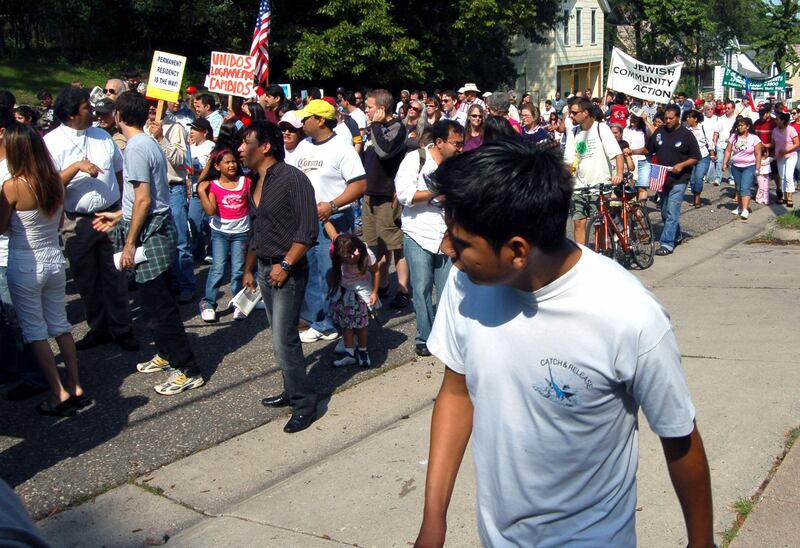 TPS was established during the first Bush administration by Congress in the Immigration Act of 1990. It is a humanitarian program which aims to suspend the deportation of migrants from countries that have been destabilized by war or natural or civil catastrophe. Immigrants in the U.S. that are undocumented may apply for TPS once Congress designates their home country eligible (Pew Research Center). They must meet strict deadlines, submit a fee, provide proof of residency since eligibility (Haiti was an exception), and meet criminal record requirements. Honduras and Nicaragua gained TPS status after Hurricane Mitch in 1998, which killed thousands and devastated the infrastructure of both countries. Migrants from Haiti became eligible after the 2010 earthquake. Because of the magnitude of damage and loss of life, Haitian migrants were able to apply for TPS up to a year after the earthquake. El Salvador became a designated recipient of TPS for the second time in 2001 when two deadly earthquakes killed thousands. Of the 200,000 Salvadorians who have had TPS since 2001, 51% have lived in the U.S. for over 20 years and 39% have homes with mortgages. The majority live in California, Texas, New York and Washington D.C. (Latin America Daily Briefing). Immigration advocates, nonprofit organizations, scholars and community groups have all denounced the decisions to end TPS, citing the current dire economic and social state of El Salvador, in which gang violence has resulted in the country experiencing one of the highest murder rates in the world. In 2015 there was one homicide per hour during peak periods of violence and just last year there were 60 homicides per 100,000 inhabitants (Latin America Daily Briefing, New York Times). Those against the decision fear that migrants forced to return to El Salvador, many who most likely have spend most of their lives in the U.S., will be vulnerable to gang violence and extortion due to the lack of family network and the perception that those in the U.S. have expendable incomes (Latin America Daily Briefing). In recent years in El Salvador, gang violence has fueled a new wave of migrants. From 2014 to 2016 over 120,000 children from the Northern Triangle countries of El Salvador, Guatemala, and Honduras (which also has TPS status) have attempted to migrate to the U.S. through Mexico. Many of them did not survive the journey (New York Times). As of now, 250 Salvadorians leave daily in search of safety from the prevalent street gangs. In recent data from Doctors Without Borders on Central Americans traveling through Mexico to reach the U.S. border, 55% of refugees and migrants are victims of blackmail or extortion, 56% have lost a relative due to violence, and 67% never felt safe at home (New York Times). Experts also decry the end of TPS, saying not only will it deprive U.S. businesses of labor, but will also saturate and destabilize the Salvadorian job market and increase the unemployment rate, which is currently at 7% (New York Times). Ending TPS will also severely decrease remittances Salvadorians in the U.S. currently send home. In 2017, remittances accounted for 17% of El Salvador’s GDP and 80% of its economic growth (Latin America Daily Briefing). With a destabilized job market and an increase in poverty and gang violence, experts warn a new cycle of illegal immigration could occur. The first time El Salvador received TPS eligibility was in 1991, when thousands of migrants were fleeing to the United States from the civil war in El Salvador. The 12 year civil war lasted from 1980 to 1992, in which the U.S. backed government implemented a “scorched earth” policy that claimed 75,000 lives (New York Times). The large wave of immigrants began arriving in the U.S. as a result of the war, the majority landing in impoverished metropolitan areas, especially around Los Angeles. In subsequent years two violent gangs, the MS13 and 18th Street, were formed by some of the refugees and their children. In the 1990s the U.S. began deporting gang members to El Salvador, where in the turmoil of rebuilding after the war the gangs flourished. “The U.S. has such a deep impact on El Salvador for its own foreign policy needs that it bears significant responsibility, not only for the flow of migrants out of El Salvador into the U.S., but also for the current conditions of violence that exist there,” said Erik Ching, a history professor at Furman University in South Carolina (New York Times). Gene Palumbo , Azem Ahmen . (2018 Jan 08). "‘Va a ser un caos’: El retorno de miles de migrantes genera angustia e ira en El Salvador". New York Times . Latin America Daily Briefing . (2018 Jan 10 ). "Decision to terminate TPS will worsen situation in El Salvador". Latin America Daily Briefing . D'Vera Cohn , Jeffrey S. Passel . (2017 Nov 08). "More than 100,000 Haitian and Central American immigrants face decision on their status in the U.S.". Pew Research Center . Constangy, Brooks, Smith & Prophete, LLP. (2018 Jan 10 ). "DHS Ending Temporary Protected Status Relief For El Salvador, Haiti, Nicaragua – And Honduras May Be Next". JDSUPRA. Rosa De Ferrari is a second year dual degree student, pursuing her Masters in International Development and Public Health. She has spent significant time in Latin America working and conducting research. Her focus is on violence again women and girls and maternal health.